Surfing indoors? Yep, welcome to the flowrider! Having surfed for over a decade, I was hoping to be reasonable at this and was looking forward to seeing what the wave would be like. So lets get the technical side out of the way. 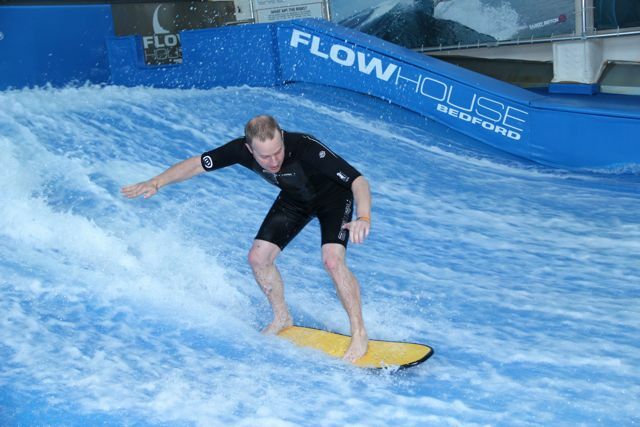 A flowrider is an indoor surfing machine. It fires water out of jets at a very high speed up a slope and into grating at the back. The water runs across a kind of soft trampoline kind of tarpaulin, to ease impact when you fall off, in fact we barely felt it. This all creates a sloping mass of moving water, just like a wave, allowing you surf it! We had a briefing and changed into our wetsuits and were soon queuing with bodyboards waiting to have our first go. It was really odd to see the first of our group heading down the wave, after all we are indoors! So with my bodyboard in my hands I jumped down on to the wave. At first it seems a little weird and wobbly, but you soon get the hang of turning the board by leaning into it and moving your feet. Moving around the wave with one of your buddies next to you, laughing and hooting was brilliant and before we knew it we were all testing ourselves. We had been briefed on a few tricks before the session started, so we all just went for it. 360’s were a popular one, and popping up on to our knees opened up all sorts of options. 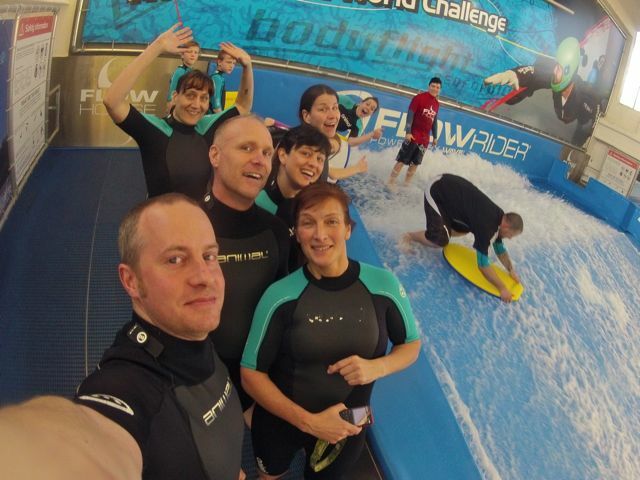 Our instructor was brilliant, giving everyone pointers whilst on the wave, this really sped things up for us, and gave us more time to have fun with them. Wipeing out wasn’t as bad as I was expecting, you barely felt the bottom and the crash mats at the back helped soften the blow. Although it was hilarious to watch other getting wiped out, really added to the fun factor! Half way though the session we were offered the chance to have a go at one of the stand-up boards, which a handful of us jumped at. I had my fingers crossed that I would be able to do this. When the boards came our however, I thought snowboarding may well have been more beneficial! We took it in turns to have a go, and it was tough at first to fight the urge to face the wave and not the instructor to the side. I managed to stand for a little while, and with more time, I reckon I could probably move around the wave a bit. A future trip there for sure! This has to be one of the best group activities I have done to date, we didn’t stop laughing, cheering and playing for the whole session. It was just great fun and worth every penny. Now I know why these machines are starting to pop up all over the UK! To find out more about the Bodyflight centre check out the website. Thank you Donna Jordan from Carpe Diem Fitness, for organising yet another great trip!